Use our resources to better understand genetics and ancient human migration. 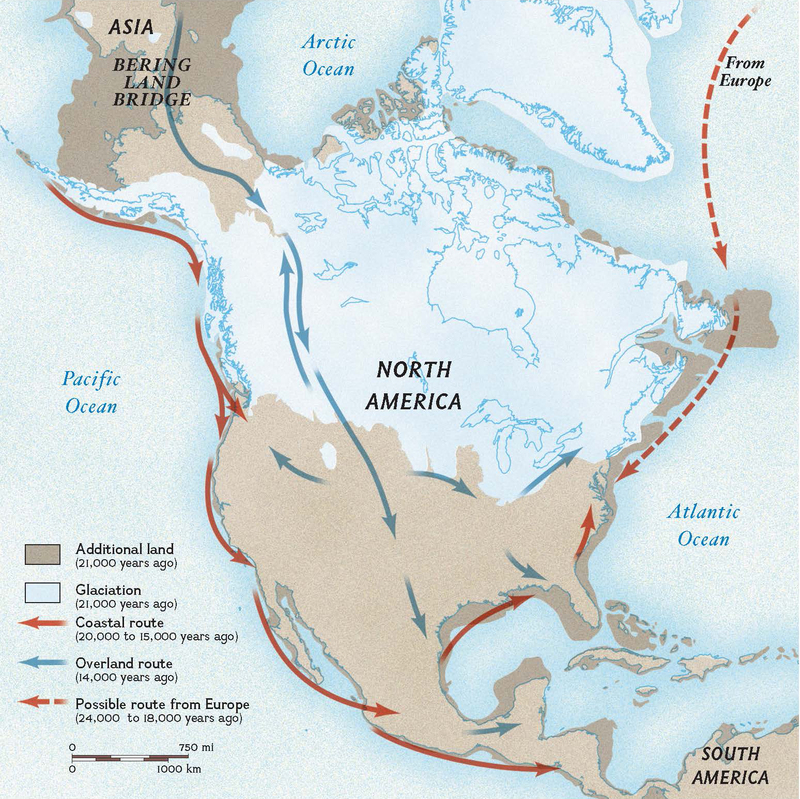 The blue arrows on this map show the icy land bridge spanning “Beringia,” where populations from Asia migrated more than 14,000 years ago. Recent genetic analysis of the remains of a member of the 12,500-year-old Clovis culture revealed markers shared with Beringian populations in Siberia, as well as Native American populations such as the Maya. Read the Reuters article, then look at our terrific map above. See if you can modify the map based on information found in the article. Use our 1-Page Map of North America or our MapMaker Interactive! Where would you label Beringia on the map? What route would you associate with ancestors of the Clovis culture? What route would you associate with the Solutrean culture? If you were a geneticist studying the Anzick boy’s DNA, what populations would you compare it to? Ancient or modern? Asian or the American? All of the above! The initial study of the Anzick boy’s genome was compared to several populations. The Anzick boy’s DNA was compared to the 24,000 year-old Mal’ta boy from Lake Baikal, Russia. The two shared about a third of their genes. The Anzick boy’s DNA was compared with contemporary DNA from an individual from the Maya population, indigenous to Central America. The Anzick boy’s DNA was compared with contemporary DNA from an individual from the Karitiana population, indigenous to the western Amazon basin in Brazil. Geneticists are people who study genes and the way they mutate and vary over time. Geneticists studying ancient human migrations often compare and contrast their findings with the work of archaeologists and paleoanthropologists, who study physical artifacts left by ancient cultures. Watch this video of geneticist and National Geographic Explorer-in-Residence Spencer Wells talking about “The Human Journey.” Skip to about 2:15, where Wells talks about the limitations of archaeology and paleoanthropology. Why do you think archaeology and paleoanthropology are nicknamed “stones and bones” by Wells? Were there “stones and bones” studied by paleoanthropologists in the Anzick/Clovis site? Archaeology is often associated with the study of ancient tools and pottery. Many of these artifacts are made of rock or clay—stones. Paleoanthropology is associated with fossils of ancient humans or human ancestors—bones. Yes, the “stones and bones” of the Anzick site are extremely important. The Anzick boy’s skeleton was covered in red ochre, a type of mineral. He was buried with about 125 artifacts, including projectile points (arrowheads) and tools made from antlers. These literal “stones and bones” immediately identified the site as Clovis. Apply online to get an educator discount for the Genographic Project. Students can participate in an international scientific study and learn about their own ancient ancestry. One high school class used the Genographic Project to create a travel blog of regions visited by their ancient ancestors. Students at Cornell University used the Genographic Project to see how many ancient migration paths were represented at the school. Read more about this fascinating topic at Nat Geo News! Pingback: Ancient DNA Links Native Americans – Welcome to the World of Ekasringa Avatar! I’m so proud of my grandma right now. That’s why I love hiking in snowy fields eating smoked meats. Reblogged this on American Indian Independent Broadcasting Network. There is a story waiting to be read about our ancestors’ origins, struggles and achievements in all of us, and we have only been able to read it with more details than ever before through studies like this.